How to Backup iPod to External Hard Drive - iMobie Inc. If you are looking for the method about how to backup iPod to external hard drive, this post will tell you the best answer. This easy-to-use iOS data transfer tool can always put your important data in the right place. Download AnyTrans prior to save your time before we start this guide on how to backup iPod to external hard drive. To free up space on iPod, you may always backup iPod via iTunes and then delete some contents on your device. But with the time goes by, you may find that there is no more space for you to put things on computer gradually, that’s because iOS backups can be multi-gigabyte files that will take up considerable space. At this moment, you may think about backing up iPod to external hard drive, but how to make it? 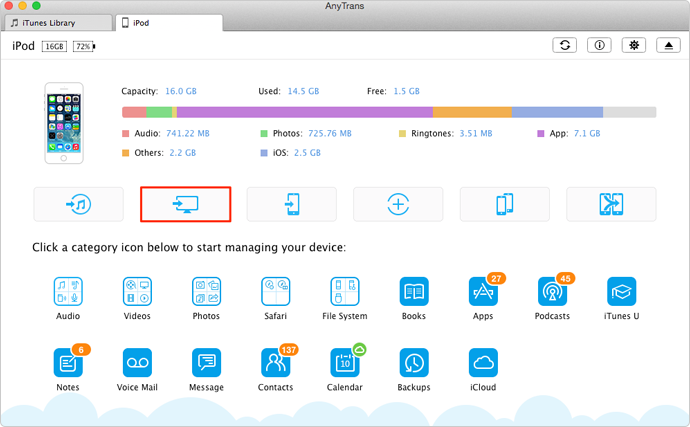 On this iMobie Help page, we will recommend you an easy-to-use iOS content manager named AnyTrans, which will help you backup iPod to external hard drive without effort. Let’s first have a brief look at this tool you need. 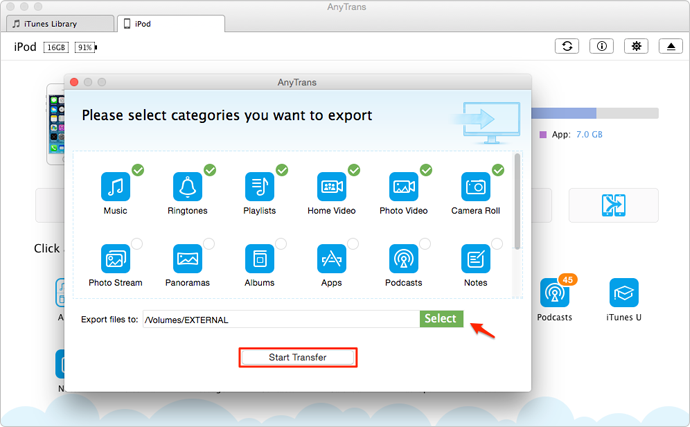 AnyTrans is a Mac/PC based iOS content transfer tool that can meet all your needs in managing your iPod/iPhone/iPad data. 1. It helps you backup iPod to external hard drive with ease, including music, photos, videos, podcasts, apps etc. 2. It allows you to preview and choose the data you want to backup before transferring them to your external hard drive. 3. It enables you to view the details of your iCloud backup and export the data from iCloud backup to external hard drive easily. 4. It also lets you transfer any files from computer/iTunes/external hard drive to your device without data loss. Step 1: Download AnyTrans and launch it > Connect your iPod to computer > Plug in your external hard drive. Step 2: Click on Content to Mac/PC shortcut button on the homepage. Step 3: Select the files that you want to backup > Click the Select button to set your external hard drive as the destination > Tap Start Transfer. As you can see, backup iPod to external hard drive couldn’t be simpler with the help of AnyTrans. Why not give it a try? You can send us an email or leave a comment if you have any questions on this guide or AnyTrans. We will write back to you as soon as possible.